1. Price reductions - through our completely free SEOversite LITE plan, we were able to help Piedmont replace their prior web marketing team. Their organic SEO monthly payment was reduced by over $2,000 per month and the pay-per-click Spring campaign was reduced by so much they were able to fund approximately 6 more months of Google Adwords with the savings. 2. 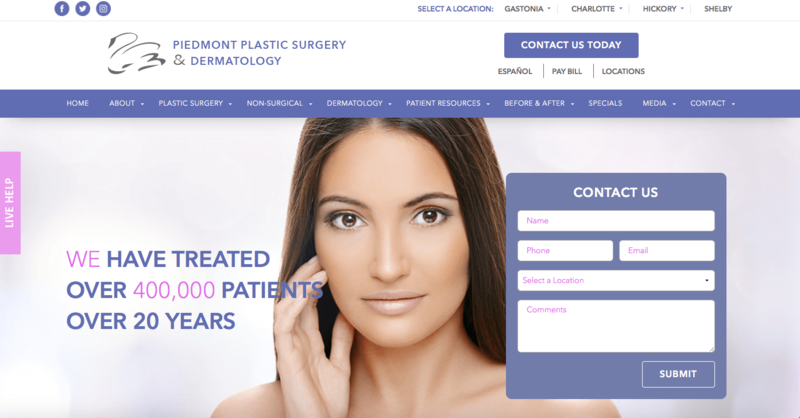 Beautiful Website Design - Piedmont had a dated website that had poor rankings and was difficult to navigate. We helped redesign and rebuild the website from scratch. We also helped redesign their landing pages for their pay-per-click campaign from scratch achieving an approximate 400% increase in lead conversion rates. Since launching, website visitors, lead counts, and calls have all increased significantly. 3. Improve SEO and rankings - the first month after launching the new website, traffic increased by approximately 40% according to PPSD. As of the publishing of this case study PPSD.com had an 800 visitor increase over last month, over 100 live chat inquiries, and overall patient calls and emails are growing monthly. 5. Ratings and Reviews Reputation Improvement - After SEOversite added iPads to each office through a company that helps collect happy patient reviews, Piedmont collected over 1,000 new patient testimonials in the first 6 months which will be spread throughout the internet, helping boost their SEO and overall reputation within the Charlotte and surrounding communities. The results achieved by using SEOversite LITE and LITE PLUS (total cost to Piedmont of $299/month - yes, really) are nothing short of astounding. SEOversite's deep industry knowledge and strong infrastructure make servicing a business doing tens of millions of dollars in revenue annually a smooth and simple process. A common question from business owners is how to showcase large teams or share accolades without singling our specific people. 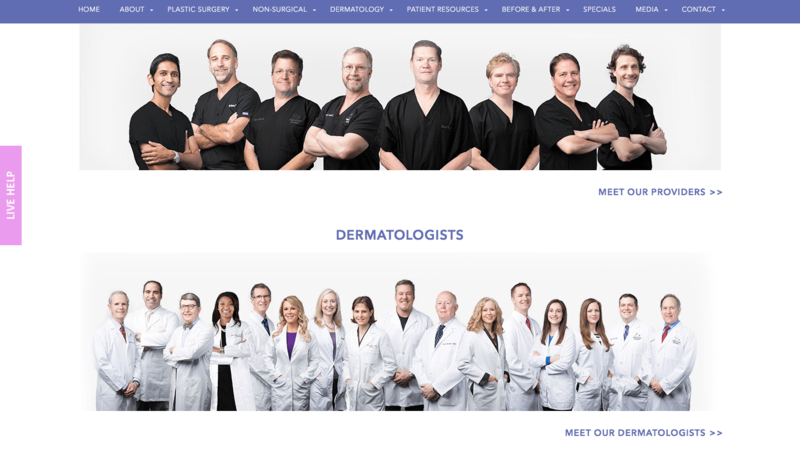 Here we started the process by helping Piedmont hire professional photographers to capture current, modern, professional photos and delineate visually between dermatologists and plastic surgeons. Simple Design. Immediate Trust Signals building confidence in the practice's experience. Ease of navigation through contact forms, live chat, and phone numbers prominently displayed, ensure great visitor-to-inquiry conversion rates. The ability to contact a business quickly and easily cannot be overstated. With a 7 location practice and a variety of buyers who may prefer live discussion, live chat, or email, we help our clients provide a multitude of options, while keeping design in mind. Here we help answer the question "how do you design a website to have superb content without clutter." Professional building photography and map design linked to specific providers make an appealing business that is simple to find. Pay-Per-Click Perfection - this pay-per-click campaign designed to drive Spring patients with a small discount converted 400% better than the average campaign we have observed. SEOversite utilized the same color scheme and branding, while guiding the design of a fresh landing page exclusive to the Google Adwords campaign. This resulted in a savings of tens of thousands of dollars over the prior Spring Campaign and better conversion rates. SEO efforts are still underway, but early results are showing massive increases in organic and overall site visitors. Here is an example of PPSD.com listed in the top position for its paid advertising campaign. By using per-per-click supplemented by organic SEO you can achieve multiple listings and better dominate the front page of Google. With organic SEO rankings rising and paid advertising supporting the organic rankings, we see visitor counts increasing by hundreds of visitors a month in many cases. 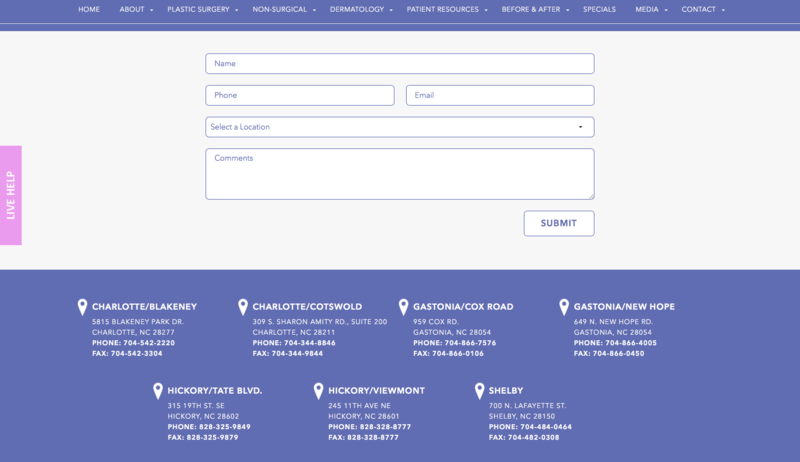 With thousands of new ratings and reviews generating using our iPad recommendation process, live chat generating hundreds of new chats many months, organic SEO rankings and visitor counts rising, and Google Adwords Pay-per-click campaigns succeeding, the sky is the limit for this practice, which is likely the largest plastics and dermatology group practice in the North Carolina area and possibly in the the Southeastern United States.